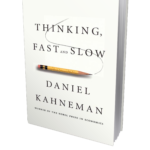 Thinking, Fast and Slow - Jon Lieff, M.D. Daniel Kahnemann won a Nobel Prize for describing the human beings’ less than rational decision-making. Here he outlines his observations of two prominent different mental decision-making systems. The first is unconscious and rapid, based upon emotions, intuition, and previous experience. The second is slow, somewhat rational and difficult to focus. He outlines in detail many of the logical illusions and fallacies that are common in ordinary thinking, as well as the very prominent role of unconscious decisions in our lives.